Praying for "Victims of Modern Martyrdom"
This week CNEWA president Msgr. John E. Kozar and Carl Hétu, national director of CNEWA Canada, are participating in the annual gathering of the ROACO, a meeting called by the Holy See’s Congregation of the Eastern Churches. Over 24 Catholic agencies are in Rome for his meeting, which is being chaired this year by Msgr. Kozar. Our first day started with an audience with Pope Francis, who blessed our upcoming deliberations and made some important remarks on the many crises affecting the Middle East. He concluded by thanking all the agencies for their good work in the region. You can read more about the pope’s remarks here. And to learn how you can contribute to our work supporting Middle East Christians, visit this page. In this image from 2007, an 11-year-old girl named Mira pauses during a game at the Pokrov day care center in Sofia, Bulgaria. 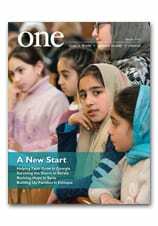 To learn more about how the center has worked to reinvigorate Bulgarian Orthodoxy, read “Under Mary’s Mantle” in the January 2007 edition of ONE. Msgr. Kozar said he found the same strong faith among the Christians in Egypt. They face a different, but no less worrisome range of problems, including the perception by their Muslim neighbors that they were supportive of, if not complicit in, the military overthrow of the elected Muslim Brotherhood government of Mohamed Morsi nearly two years ago. Unlike other parts of the Middle East where better-educated Christians are at least better financially positioned, Christians in Egypt are often at the bottom of the social strata. Part of the reason Msgr. Kozar visited Egypt was to show CNEWA’s solidarity for this marginalized, impoverished community. On the outskirts of Cairo is a municipal dump and on the fringes of that dump live 900,000 people in a squalid shantytown. They make their living picking through the garbage. These “garbage pickers” are overwhelmingly Christian. There are no public utilities and no water, no sewers and no electricity. You won’t find the shantytown on any government map. Read more and check out additional photos at Catholic New York. And to learn more about the plight of the garbage pickers of Egypt, read “Salvaging Dignity” in the September 2012 edition of ONE. By 1984, more than 50 needy children — many of them former street kids — had lived at the home for varying periods, with more arriving every year. Encouraged by generous supporters, Mother Virginie began to consider buying a plot of land for a new, larger house for the children. Since moving into the new house in 1987, Mother Virginie explains that she and her staff have continued to provide children with “an embracing family atmosphere.” Every child attends school in the neighborhood, many study music and theater, and also sing at churches across the region. Thousands of sisters. Millions of small miracles. To support the good work of sisters throughout CNEWA’s world, click here.